Cueing records is a serious business. You can damage your expensive record with manual cueing no matter how cautious you are. The reason is, human heads never remain steady and records are delicate. You can easily gouge the grooves or break the needle with manual cueing of songs. There’s a better way to do that. You can see a cueing lever which is meant for lifting up and lowering down the needle calculatedly. With cueing lever, you can aim for the right place on the record and place the needle as smoothly as possible. In connection to wrong cueing, there’s another mistake people often make unknowingly – dropping the needle casually. That’s a sin in the vinyl world. If the needle is dropped or picked up casually on places where sound fades out, repetitive attempts can damage those sensitive areas in the grooves. As a result, those areas will gouge out. Take your time and allow the music to fade out. If possible, avoid removing the needle in the middle of the album. Instead, let the entire side to finish. Another mistake in the list attributed to those impatient listeners who always want to run ahead of time, picking the record without waiting for the platter to stop. Remember, records are quite delicate and can get damaged or scratched with uneven friction. If you have a habit of removing record from the moving platter, you’ll waste your precious record soon. Vinyl surface can be tempting for some people. At the same time, it’s sensitive enough to get the body oil on the finger and soak it in. Vinyl already attracts dust and dirt while spinning, because of all those vibrations and the magnetic field created inside the cartridge. Dust particles can easily stick to the oil and penetrate inside the grooves. Consequently, the sound quality will be affected. So, avoid running bare fingers on the record’s surface. If you’re too excited to hold the record, hold it from the outer edges. Just like you get ready to go out for the party, your records also need preps before being placed on the platter. Your record may have developed a layer of dust which a naked eye can’t identify. Playing it as it is would help tiny dust particles penetrate further inside the grooves. You’ll experience slips and skips on the record as the needle runs over dust particles, pushing them further down inside the grooves. Some dust particles, once settled inside, may never be removed even after cleaning the whole thing. So, better not let them settled. Make a habit of cleaning the record before and after the song-play. In connection to cleaning, some people use tap water to clean the record surface, while some use unapproved solvents. 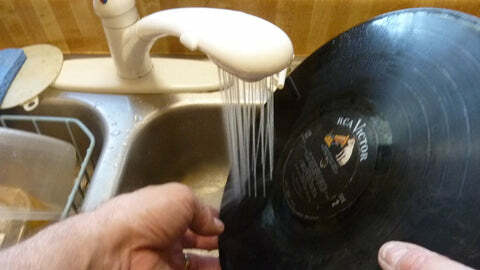 If there’s no standard cleaning method for records, it doesn’t mean you can clean them with homemade tricks. Tap water on some places contains high amount of minerals that can be deposited easily onto the record’s surface. Turntables also accumulate dust and dirt and this is due to their functionality. As the record spins, the vibrations coming from the stylus transfer to the magnetic cartridge, which then creates magnetic field. Dust and dirt in the surrounding get attracted to the magnetic field and deposit on to the platter, stylus and cartridge. So, if you think your turntable cannot hurt your records, think again. Just like the way you clean the record before and after playing, do the same with the platter of the turntable. Stylus or needle is very important for record playing and sound production. It is the main source of sound that picks up vibrations in the grooves and produce high precision sound. Needle has to adjust inside the grooves that are thinner than human hair, so it needs to be cleaned and checked properly. Take a magnifying glass to inspect the tip of the needle that comes in contact with the record. Make sure that the tip remains rounded, not chipped or pointed. If it becomes chipped, replace it with a new one; otherwise, it will make scratches on the record. Wet-playing is a temporary solution for records that have become old and have developed a stubborn and unseen layer of dust. But wet-playing is, by no means advisable, because it will not only cause more damage to the record, it will affect the sound quality as well as the functionality and construction of the needle. So, never wet-play your records. With everything mentioned about how catchy your vinyl record is, you’ll never leave it in open air, will you? Moreover, if the record has been exposed to light and dust over a period of time, its sound quality will be deteriorated. So, never take chances with your favorite records. Always store them properly after playing. Keep your turntable in good shape by replacing/upgrading its components from time to time.